We are an affluent organization, offering a superior quality array of Sandalwood Fan. Elegantly designed in spectrum of patterns, sizes and shapes, these fans are made by our creative professionals using quality assured raw material. Extensively used for gifting purposes, these fans are highly appreciated among our clients. 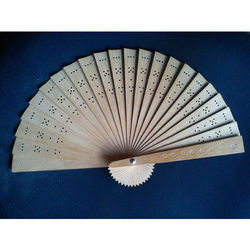 Catering to the demands of customers as a reliable organization, we are offering Decorative Wooden Fans. Used for decoration purposes, our offered fans are designed as per the prevailing market trends. Wooden Pakhia ( velevt based blue) available in all colours , and we can supply to all over the india and in overseaus market also . Asia Engineering & Industries Co. (P) Ltd. Minimum Order One Carton - 1200 Pieces. We have introduced a number of decorative items under our product range including Decorative Wooden Fans. These pankhis are imparted with attractive color & design and can be purchased at minimal prices. Used widely as decorative items, these offerings are widely cherished among our customers. 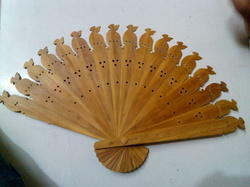 We offer a mesmeric collection of Decorative Wooden Fans. These are used for decoration as well as for fanning purpose.